It seems that almost everyone want to lead others, in other words, to become the center of power. 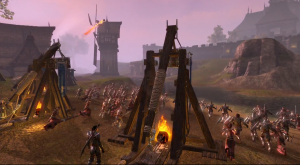 Likewise, in the world of net games, the discussion of how to become the elder scrolls online emperor gradually grabs the eye of the crazy players. We can give you a rough introduction of puzzle like this; can the players become emperors or empresses? Whether it only suitable for the most popular players or the leaders of the fractions? If so, then how long can we become emperors? Hence, a fierce controversy is on the stage. The Sleepinglll showed his sincere willingness that Nothing solid is known about that. If a player can become the Emperor or get a title like the thane or yarl, I hope the titles cannot be bought with money, neither virtual nor realistic. Naturally, it is obviously becomes the willingness of each player. Someone said I would choose an imperial as my first character as I did in oblivion and skyrim, but I would go with the closest one to that. The son or daughter of the old kingdom, so to speak the cradle of the first human empire. Although I really wish that Imperials were a playable race and they would have an opportunity to choose which alliance they want to side with. Aiming to the kind of the phenomenon, one participant said, as for the availability for one of the many names of the famed hero emperor , the developers just might decide to prevent players from choosing them at character creation; It has happened before in other mmo games.